Do you remember this china pattern? 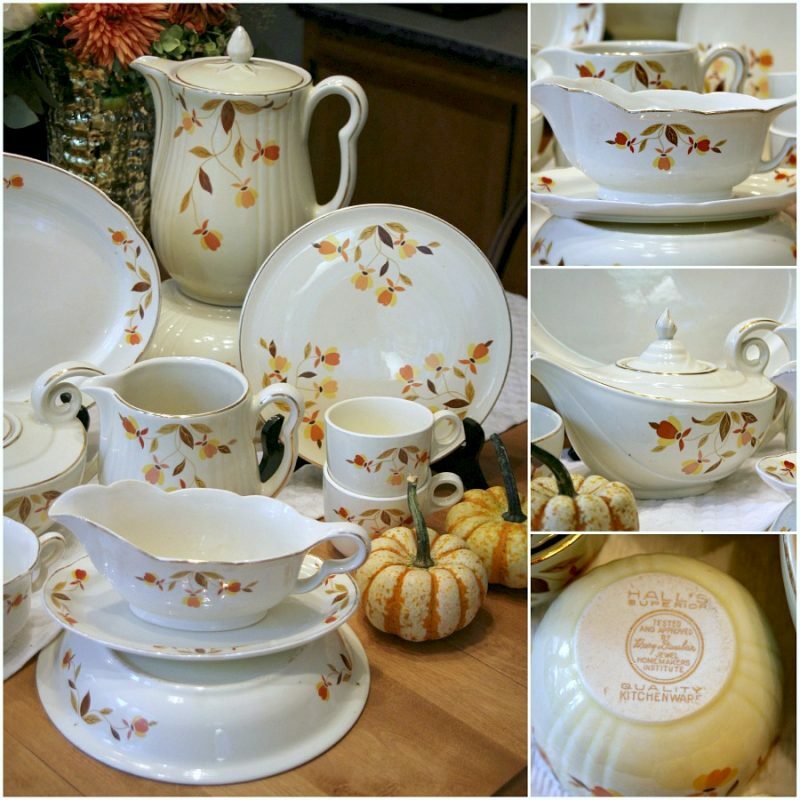 It is called Autumn Leaf pottery produced by the Hall Pottery Company in Liverpool, Ohio. After emptying my mom’s home, John and I have determined to downsize in our own home, keeping just what we use and enjoy. Bringing containers out of our storage brought to light these familiar pieces I began collecting many years ago. Unwrapping each piece I noticed the date of 1991 on the newspaper protecting them. They’ve been packed away a long time! Though the colors never really matched my decor, they do look nice for this time of year. Lots will go but these Autumn Leaf pottery pieces will be kept and used each autumn season. Founded in 1903 by Robert Hall, the company based in Liverpool, Ohio started with institutional products for hospitals. The son, Robert Taggart Hall, took over the business after his father’s death and immediately put all of his efforts into a new, single fire development process. The basis of the technique actually developed during the Ming Dynasty in the mid-16th century but Hall’s process used contemporary equipment. The advantage of single firing allowed a fusion of the basic material, the color and glaze all fired at a temperature of 2,400 degrees Fahrenheit. The result was a strong product that resisted crazing and was non porous. 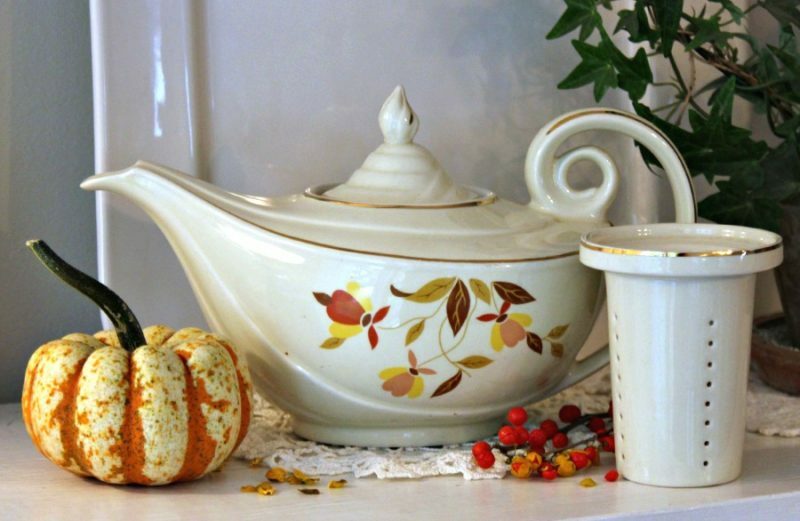 Hall Autumn Leaf Teapot is such a great piece and has a strainer insert. 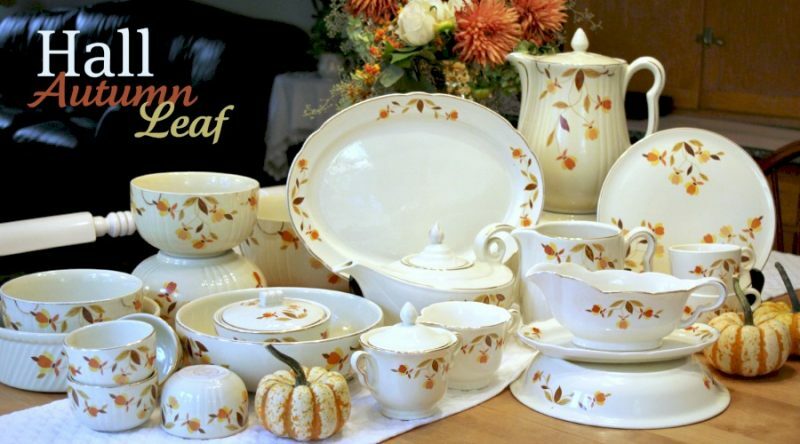 If you liked this post, you might like to see a breakfast featuring these Autumn Leaf pottery pieces. 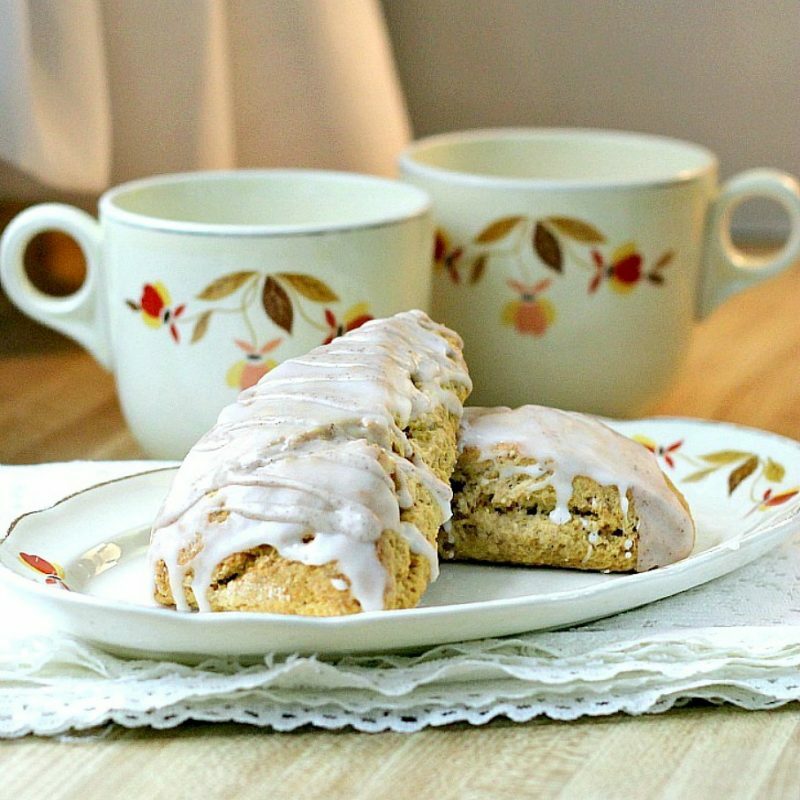 Click Pumpkin Scones to read and get the recipe. I have the teapot and a few small pieces from a Great Aunt….you have quite a large collection! I recognized this pattern as being yours in an antique store yesterday. I photographed and posted about a cube tea pot today. I had never seen one before! Absolutely gorgeous! What a beautiful Autumn – or Thanksgiving – table you could set. and what a lovely blog you have, I also have enjoyed my vist with you. So sorry to hear of the loss of your Mom but so glad to hear she knows the Lord and is with Him! What a blessing that is to your family and those that loved her. love that….one of my favs. We also have a child we sponser thru feed the children, he is from Ethiopia. And Congratulations on the new coming Grandchild, I assume!! Just popped over to say goodmorning! I'm trying to get over a virus, and I thought it was going away till I woke up with a sort ofcold?? Anyway, its not too bad, we will go for groceries soon. Hopefully =). Such a charming vintage look. Lorraine, I linked YOUR recipe for your apple packages on my post because I love how your recipe uses the orange! And no additional "soda" to add even more calories! Thanks for sharing! Enjoy your weekend! I have a few pieces of this pattern and I always display and use it every fall. It's perfect! I have a few pieces of Hall, but I have never seen this beautiful pattern – just lovely! What a beautiful set of china to unwrap. Somehow, I think that you could make any set of china look good on your tablescapes, and this is no exception. I like the colors, especially with the mums you have with them. Will you unwrap some more collections for us? These are beautiful and I think my Mom used to have a set of this pattern! 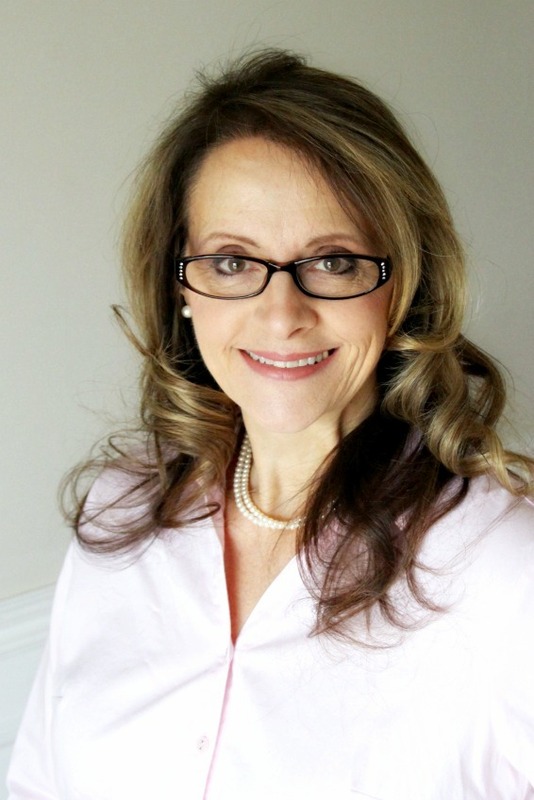 I love them…thanks for sharing! I once entered upon an antique shop with a room decorated with black and white tile flooring, and vintage kitchen cabinets, etc. and all things HALL. That began my love of Hall pottery. I collect hall creamers with, yes, the hall stamp on the bottom If you look at my sidebar you will see them on a little shelf. They are fun to look for when we wander through antique shops. We rarely buy things, but there is always a thrill to the hunt (and it;s not easy to find a hall creamer.) Your dishes are perfect for fall. I like seeing the dates and the "news" on/in newsprint used for wrapping! 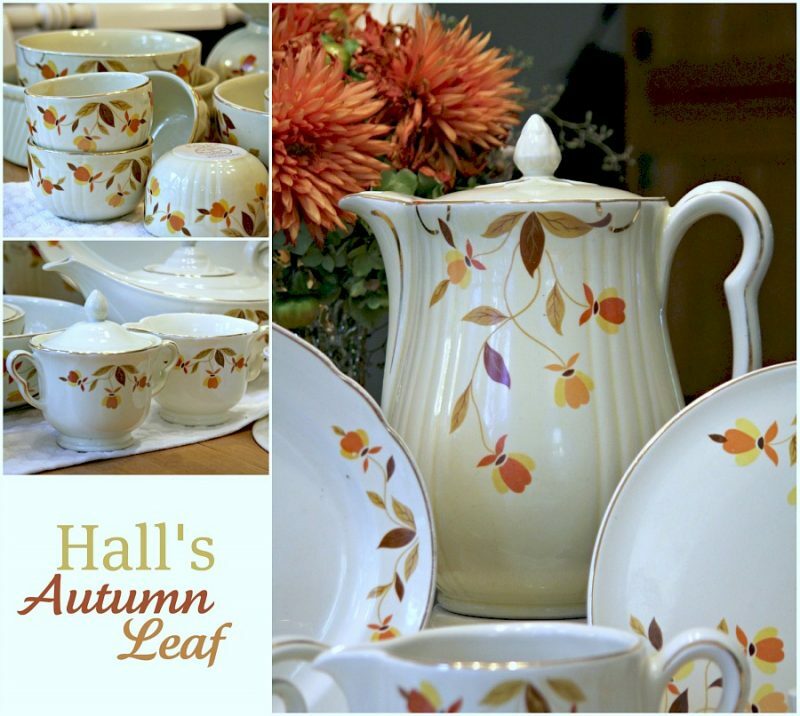 Your Hall china 'Autumn Leaf' is perfect! What a treasure to cherish and bring sweet memories each season as it is brought out! Sweet Autumn Blessings to you! What a beautiful collection of Hall China! You must have a very complete set. The sugar & creamer are especially sweet. 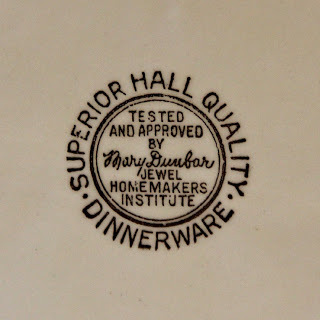 We visited Hall China in Ohio a couple of times on our trips to the Homer Laughlln outlet. They are fairly close together. Oh, I see your Pinterest button. I'm going to go and have fun looking. I hope you'll visit my board too. I've had a ton of fun with Pinterest! Thank you for your encouraging comment about my testimony post. That is my prayer too, that someone will open their hearts to the Lord. He is calling them, through us… but time is flying by. What a lovely set of dishes! You're so lucky to have a special set to pull out every autumn. What beautiful China! I have a weakness for finding vintage pieces, even if just one or two, at Goodwill or other second-hand places. I'll eagerly come home and research the markings on the back to see if they are of any value. This set is absolutely gorgeous! I have this same set also. We called it Jewel-T. I inherited it from my Mema. When we finally made the decision to move out of our home and into our 5th wheel..I divided the set up with my 4 girls. My son will get my set down the road. Thanks for sharing your set..I had forgot to take a picture of the complete set I had. Too late now. These dishes will be a special to your family for years to come. I'm so glad you chose to keep them and am looking forward to a pretty tablescape from you! AND your pumpkin bars look divine Lorraine! I have a few pieces of Autumn leaf put away in the attic. Such a shame…I think I'll pull down a few boxes and see if I can locate it. Yours is beautitful. I adore that "I dream of Jeanie" teapot. These dishes are perfect for this time of year. I noticed one piece in an earlier post of yours and wondered about it! And these were kept away in storage all these years?? They are absolutely beautiful!! I can see you wanting to keep these and use them during the fall season. They're beautiful. I hope going through all the many items in your mom's house is bringing you happy memories! Enjoy your day! These are really pretty and perfect for this time of year(Definate keepers)My husband and I are also in a purging mood, its almost as if the stuff I have stored is weighing me down. Cleaning out someone elses home can be an eye opener. What treasure to have, and to use. see why you would want to keep it.